The Frigidaire FFAP7033T1 70 Pint Dehumidifier with Pump is not simply an updated model in the Frigidaire range but a uniquely new offer within that range. For the first time the company is supplying a portable dehumidifier with a condensate pump built into the appliance. Integral pumps are not new to the market but Frigidaire clearly feels it may be losing sales to other leading brands which already include this feature. In all other respects the FFAP7033T1 is identical to the 70 pint FFAD7033R1. It has Energy Star® rating and is capable of controlling humidity in an area of up to 1300 square feet. It is well suited for use in a basement provided that the temperature does not usually fall below 60°F for extended periods. User reviews are fewer in number than for the equivalent model without the pump but there are sufficient for us to say confidently the most buyers are happy with their purchase and we are pleased to recommend the Frigidaire FFAP7033T1 to our visitors. Adjustable Humidistat - This is your humidity control with which you may select the level of humidity you wish the appliance to maintain. If you are new to dehumidifiers try 50% to begin with. Most people find this comfortable and it will prevent damp and mold problems. 3 Speed Fan - A higher fan speed means quicker drying but more noise. You may pick between three speed levels according to your priority at the time. Automatic Defrost - Much like a refrigerator dehumidifiers suffer from a build up of ice. This build up can occur at room temperature and is nothing to worry about. Once the appliance detects the ice it will stop dehumidifying and run only with the fan so that the flow of air can melt the ice. On/Off Timer - This device allows you to instruct your dehumidifier to turn on or turn off at a specified time within the following 24 hours. Auto Restart - If you suffer a power outage your dehumidifier will stop. As the name of the feature suggests, once power is restored the appliance restarts automatically at the setting you programmed earlier. Not all dehumidifiers have this feature. Continuous Drainage Option - If you have bought a dehumidifier with a pump you will not normally be using this simple gravity feed drainage but it is available if your pump should fail. Integral Condensate Pump - This feature enables continuous drainage to an outlet further away from the appliance than a gravity fed system could reach. It also allows you to drain to an outlet at a higher level than the dehumidifier. Typically the vertical lift achievable is from 12 to 15 feet but no precise figure is included in the published specification so we cannot state this with absolute certainty. Full Tank Indicator - If you are using the bucket an indicator will show when it's nearly full so you may empty it. If you don't notice or cannot see the indicator an Automatic Shutoff feature stops the appliance from operating to ensure no water leaks occur. Washable Antibacterial Filter -The filter should be removed and cleaned every two weeks or so. A clean filter protects the dehumidifier while a clogged filter may result in damage and, in extreme cases, the appliance catching fire. Portability - The Frigidaire FFAP7033T1 weighs a manageable 47 pounds. It has four caster wheels and a carry handle so can be moved easily within your home. 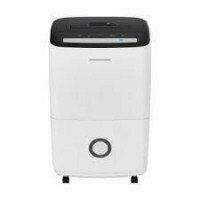 A moderate number of reviews of the Frigidaire FFAP7033T1 70 pint dehumidifier with pump are available and a large majority indicate a high level of satisfaction among users. As the model with a pump is identical to the model without a pump in every other respect, and the verdict is positive for that model also, this comes as no surprise. The only key item on which to report is experience with the internal pump. Here too almost all users report that they are happy with the operation and performance of the pump. The only negative comment, which is found in a significant number of reviews, concerns the cover which has to be removed to install one end of the drain hose into the appliance. This cover appears to be very difficult to remove and, reading the reviews, they suggest that some expletives were to be heard from otherwise very decent and respectable folks as they struggled with this challenge. Once the cover has been removed everything is reported to be fine and satisfaction is reported by most users. The Frigidaire FFAP7033T1 70 pint dehumidifier with pump works well and there are no recurring issues with the exception of the pesky drain opening cover. Obviously the FFAP7033T1 is more expensive than the equivalent model and only you can know if that extra expenditure is worthwhile to you and in your circumstances. If you feel that it is we are pleased to recommend the Frigidaire FFAP7033T1 and trust you will be as pleased with it as most other purchasers have been.